Courtyard By Marriott Santiago Specifies Teledex Opal Series Hotel Phones. Courtyard Santiago Las Condes by Marriott has selected Teledex brand Opal Series hotel phones for installation in the property's 210 guest rooms, and throughout the hotel common areas. Teledex Opal 1005 single-line, analog 5 guest service key phones and Opal trimline sets have been installed in the property. The installation has been completed by Teleswitch, Inc., a technology solutions provider and Cetis channel partner headquartered in Miami, Florida, and Sixbell Nekotec Solutions, a leader in Latin American market innovation, development and integration of technology solutions for communications with offices in Santiago. 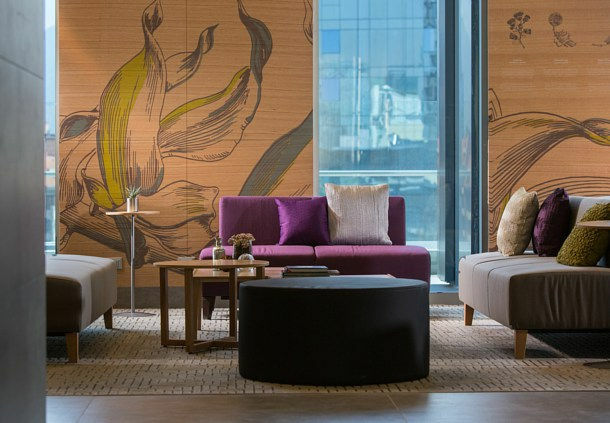 As one of the premier hotels in Santiago, Chile, Courtyard Sanitago Las Condes offers travelers modern amenities and technologies in stylish surroundings. Just a five-minute walk from the new financial district of Nueva Las Condes and across from high-end mall Parque Arauco, and near ski centers and vineyards, Courtyard Santiago hotel is a perfect destination for business and leisure travelers alike. Click here to make a reservation at Courtyard Sanitago Las Condes. Click here to request product and pricing details on Teledex brand hotel phones. Big Data And The Hotel Stay. The Critical Connection. The industry buzz around "Big Data" is deafening. 'Big Data Analytics ' - its uses, abuses, and place in the playbook of travel technology tools - has filled hundreds of articles and many thousands of words over the course of the past five years. But there is a huge disconnect between the ethereal language of Big Data, and the actual experience of the hotel guest. Is there a connection? How can hotel managers, owners and brand executives actually use data to make guest experiences better?? Let's begin from a simple premise: The hotel stay is the core product of the entire leisure travel experience. So whatever the emerging technologies solve, they must center on the guest experience first and foremost. There have been many attempts in the use of Big Data – for example, in the potential use of a hotel's loyalty database in distribution. A few years ago, everyone started talking about 'personalized offers' - and despite muted results, it has already morphed into 'hyper-personalization'. Yet in spite of all attempts, the vision of making 'personalized offers at every touchpoint' continues to elude us. The marshaling of a hotel's data for giving guests "the right room at the right time at the right price" seems like an illusory objective at best. It has been illusory since the 1990s - when the phrase was invented by creative revenue managers! And let's be honest: How much more "personalized" are guest experiences than they were two, three or even five years ago? Likely, you will hear about restaurants, spas, attractions and other ancillary spends. But that's just what these offerings are – ancillary. The fundamental question remains, how can we produce greater personalization of, and guest satisfaction from, our core product – the guest room? Yes, the guest room - the main purchase the customer is making. It is her biggest spend, and turns into a private, almost intimate space for the duration of the stay. But once a room has been built, furnished and equipped, there isn't much we can physically change about it, to make it more personal. And so we keep looking to anything but the room itself, to try to personalize, and improve, a guest's stay. One thing is for certain: so far, the impact of Big Data, and of all the valuable information being collected - which could, in fact, improve a guest stay – has been net to nil. In the remainder of this article – part one in a series -, I will look at some reasons hotels have failed to apply Big Data to "the real world" of the hotel guest so far – and what we are trending towards. As a hotel community, we have never really understood what Big Data is -- and is not. It begins from the nature of a hotel's data sets, and how they are accessed – but how many of us really understand how to access those data sets, and do it well? In many cases, the data sets available are just too miniscule, the differences between one and another record are too minute to be used in a meaningful way. As a result, lots of time, money and energy have gone into a host of Big Data driven add-on tools that all solve some hotel problems, but none provide a truly holistic, comprehensive, and monetizable view of guest expectations. The real uses, and impact, of Big Data so far at hotels – has been remarkably small. The Point of Sale has always received special attention. It is after all the very first interaction for the vast majority of guests. But what is most interesting is how the Online Travel Agencies (OTAs) have turned the Point of Sale not just into a moment of purchase decision – but a process that reverberates to impact the entire guest experience throughout his stay. Let's take a look inside the process, to see what they have done. OTAs are removed from the hotel room - the actual product. They hold no traditional points of view and no convictions of certain undeniable truths about 'our' guests. This has allowed them to use Data to analyze and then use a consumer's behavioral patterns in a ruthless and disciplined manner. Because the delivery of the promise made during the sale is entirely up to the hotel, OTAs can also apply Data to the promise at their leisure, while completely ignoring such 'mundane' constraints as actual availability. Click here to read the entire article at Hotel-Online. Visit With Us On LiveChat! Did you know that you can receive online assistance with product pricing, support, and troubleshooting? The Cetis Account Manager team is here to help you with any hospitality phone-related questions that you may have – before, during, or after your purchase. You may find the LiveChat feature on the lower right side of our Cetis, Teledex, TeleMatrix, and Scitec websites. We look forward to chatting with you! The Value Of Hotel Phones. Cetis not only offers 12 distinct hotel phone design families, but also a wide range of phone color, color accent, and color faceplate options to match your hotel decor preferences or hotel franchise brand standards. Most Cetis hotel phone models are available in standard Black or Ash. Choose TeleMatrix 9600 Series cordless, and 3300 Series corded models with 7 standard or custom color options designed to match your hotel room and property decor. For your next hotel phone order, specify rich, colorful Cetis gloss plastic faceplates designed to complement the color of the phone and in-room appliances. Or, specify standard Cetis paper faceplates in custom colors to meet brand standards, or support your boutique property look. Free full custom color faceplates are available with your minimum 50-phone order, plus free guest service key programming, and free shipping in the Continental United States. Have enough spare phones to prevent room vacancies and complaints? Make sure to stock plenty of clean, working Cetis hotel phones, and parts for repairs as well. Between normal wear and tear, spills, sticky keys, and frayed cords, stocking extra parts and phones for easy replacement will prevent a lot of hassle in the long run. We recommend stocking an extra 15% of phones for your guestrooms, plus additional cords and handsets for replacements. Cetis supports the largest installed base of hotel phones in the world, including more than 30 million Cetis analog phones, and 300,000+ VoIP phones. Our low out-of-box failure rate helps ensure successful installations from the outset, and the Cetis 5-year full manufacturer warranty protects the investment of hoteliers for many years. In fact, we often receive reports of Cetis hotel phones still on the job after 10 to 15 years of service! In addition to the new Cetis headquarters office and warehouse in Colorado, Cetis maintains office/warehouse locations in Beijing, Malaysia, United Kingdom, India, and Dubai to help directly support Cetis hotels in every region of the world. Cetis certified channel partners are also available to provide spare phones, regional repair services, or warranty claims assistance to our loyal hotel customers. Click here to ask a question or let us know how we can support your Cetis phones, or assist you with your hotel renovation or new construction project.